After a driver or passenger has been involved in a collision, disorientation, confusion, and possibly panic, are normal human reactions. In this series of articles on how to survive various emergency situations, we want to give the driver some good, common sense advice in the hope that, instead of panicking, a driver will recall the information and act correctly to get out of a dangerous situation. Even though the chances of any of these events happening to you are rare, knowing what to do in advance can prevent panic and help you cope with a bad situation. Regardless of the crash situation you may find yourself in, your chances of survival increase by up to 55% if you are wearing your seatbelt. You are always safer, confined within the vehicle than you would be if you were ejected out the window or tossed around in the vehicle as it reacts to a major crash. Seat belts are always survival tip number one! Don't Panic! Panic is the enemy in any survival situation. Panic can lead to bad choices. Try to remain calm, take stock of your surroundings and the situation you are in. After surviving a car crash, the first thing you will want to do is exit the scene and remove you and your passengers away from a possible secondary collision situation. Panic will make that escape much more difficult. When airbags deploy in a collision, the first thought many people have is that the car is on fire. While always possible, the chances of a vehicle catching fire, due to the collision, are rare. There are two reasons why people think that the car is on fire after the airbags deploy. 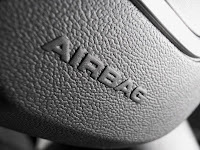 The folds of an airbag are coated with talcum powder to keep the rubberized fabric from sticking to itself in long term storage and to ensure a smooth deployment. Once the airbag deploys, the interior of the car is filled with talcum powder. When the airbags deploy, a small explosive charge ignites two chemicals and that react to form the nitrogen that is used to fill the airbag. The smell of that chemical reaction is unfamiliar to most and that, combined with the talcum powder filling the car’s interior, is the reason why many people think the car is on fire. That isn’t the case. If the car is truly on fire, the smoke will most likely be dark and oily. Airbags are terrific lifesaving devices but remember, they won’t deploy unless the sensor takes a direct hit. Also, because airbags are only effective if people wear their seat belts, the airbag may not work if the seat belt isn’t securely fastened. After the airbags deploy, they will deflate one second later to make escaping from the car easier. If, for any reason, you find yourself trapped inside a vehicle and you are unable to open the doors, or windows, you may find it very difficult to smash the windows from inside. The tempered glass used in car windows is very strong and difficult to break. There is a cheap spring loaded punch, sold in most auto parts stores for less than $10 that is designed to quickly shatter the window. Auto windows are designed to shatter into thousands of small, relatively smooth shards so the chances of being cut are minimal but you will want to shield your eyes before breaking the glass. Keep the window punch handy and close to the driver’s position but make sure it is secure. Leaving it out on the dash will just allow it to fly around the car in a crash and you won’t be able to find it when you need it. Once you have escaped the vehicle, you will want to place you and your passengers well off the roadway. The chances of another, secondary crash are very real so you need to stay as far away as you can until help arrives.